golf vacation | GolfTrip.com - Golf Tips, Vacations, Packages, Destinations and more! Possessing unsurpassed beauty of natural vegetation, trees, water features, and waste areas, the Tradition Golf Club offers a challenging yet rewarding round of golf to every players. Opened in 1994, the Tradition is located near the the Willbrook community in Litchfield Bech. Ron Garl was able to shape this golf vacation destination into a paradise with picturesque views and landscapes. This par 72 course has 6,875-yard layout from the back tees with course rating of 72.6 and slope rating of 132. Known to have a traditional theme, this course is able to withstood the test of time. The Tradition Golf Club offers various amenities starting from full driving range, large practice facilities, up to bar and restaurants offering fine and casual dining. In 2008, Golf Digest rated this course 4.5 stars and was included in the Top Fairways for 1998 by Golf for Women. This golf vacation resort was also nominated as one of the Best New Public Course by Golf Digest in 1996. 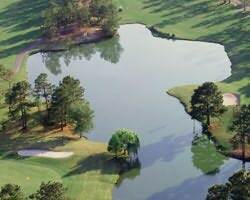 Furthermore, the Tradition is included in South Carolina’s Golf Course of the Year in 2000. Putting together all these credentials, this golf resort has been offering excellent quality of service to their clients from the day that they’ve opened. The Tradition Golf Club has several water carries which include the par 4 seventh hole being the longest of them all. Tee times can be booked online by accessing the resort’s website via the Internet. Aside from real time booking, clients can also avail of various golf vacation packages offered by the resort to honor the loyalty of their valued clients who don’t get tired of playing at their course over and over again. Being the only university golf course in the Grand Stand, The Hackler Golf Course is located outside of Conway, in South Carolina. 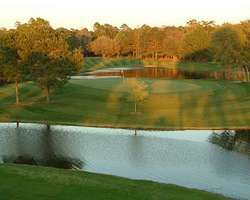 This par 72 championship course is maintained and operated by Horry Georgetown Technical College’s Sports Turf Management program and University’s Professional Golf Management program respectively. This golf vacation destination offers breath taking views of the beach, natural vegetation, and rolling hills. Formerly known as Quail Creek, this resort is one of the most visited course along the beach. Built in 1968, this resort has been serving local and international clients which come back year after year to experience the same level of ecstasy while playing on the course. Meticulously manicured greens, wide fairways, and various water hazards as well as sand bunkers make this golf vacation resort interesting and challenging. Accommodating staffs provide all the needs of the clients as they unwind, play, and relax on the resort. Having four sets of tees, The Hackler Golf Course is perfect for players of any skill levels. This 18-hole, semi-private resort has an open guest policy and year round golf season. Rental carts are already included in the green fees and visitors can enjoy sweating up on the practice facilities as much as they can. The convenience of an all grass driving range, restaurants, luxurious hotels, and sumptuous meals make guests wanting more before they leave. With 6,812 yards from the back tees, The Hackler Golf Course has a fully stocked pro shop selling officially licensed Chanticleer apparel. Aside from an excellent tournament program, the resort also offers different golf vacation packages which allow guests to save a lot of money while enjoying their trips. 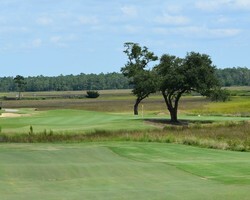 Opened in 1990, the Sea Trail Plantation & Golf – Jones Course is located along the Sunset Beach in North Carolina. Crafted by the renowned golf course architect Rees Jones, this course became a favorite of local and international golfers. Having four sets of tees, this golf vacation destination allows players of different skill levels to experience a challenging yet rewarding round. With 6,761 yards from the back tee, this par 72 championship course has eleven holes in which water come into play. Added hindrances such as white sand bunkers, roughs, and natural elevation changes make every round of golf unforgettable for players. The Sea Trail Plantation & Golf – Jones Course has elevated Bentgrass greens, wide fairways, large expanse bunkers, mounds, and pot. Rees Jones definitely exhausted all of his resources to guard his greens. This golf vacation resort offers various amenities including driving range, large practice facilities, private streets for walking, jogging, or biking, club rental, cart rental, fully stocked pro shop, and restaurants. The 90-seat celestial theater Museum with 40-foot projection dome is also located near this resort and can serve as the perfect educational trip for kids. The designer-approved renovations made in this course boost its popularity among local visitors and tourists alike. Various golf vacation packages are offered to valued clients including 3 nights 3 rounds, 3 nights 4 rounds, 3 nights 6 rounds, and premium golf. The Sea Trail Plantation & Golf – Jones Course also accepts memberships for those players who wanted to have added privileges. A list of membership benefits is posted on their website. Visitors can freely book their tee times online and avail for packages to save a lot of money while still enjoying their vacations. 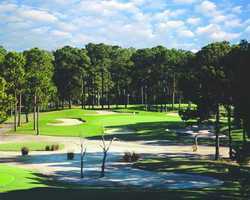 Having distinct hole features all throughout the course, the Sea Trail Plantation & Golf – Byrd Course was opened in the fall of 1990 at the Sea Trail Resort & Golf Links along side the Sunset Beach, North Carolina. Its memorable beauty and exciting undulations make playing golf perfectly challenging yet rewarding. This resort is ideal for any planned and unplanned golf trips as players are warranted with warm welcome and high quality of services when they enter the resort. Built with several man made lakes, this par 72 signature course is perfectly bordered with various trees and natural vegetation providing a traditional theme closer to nature. The Sea Trail Plantation & Golf – Byrd Course require players to have a different approach when making shots towards various holes. Strategically placed white sand bunkers and water hazards complement Bermuda greens perfectly harboring breath taking scenery while players traverse from hole to hole. This golf vacation resort has a complete driving range with large practice facilities to help beginners learn their way around the sport. Practice putting and chipping greens also allow advanced players to warm up before their rounds. With four sets of tees, this resort welcomes players of any skill levels. The 18th hole of the Sea Trail Plantation & Golf – Byrd Course can be found between two beautiful ponds which can be viewed from the Jones-Byrd Clubhouse. Aside from the sumptuous meals for breakfast, lunch and dinner, the resort also offers a fully stocked pro shop, private streets for biking, walking, or jogging, bike rentals, 90-seat celestial theater at the Carolina’s Planetarium, and competitive golf vacation package deals. 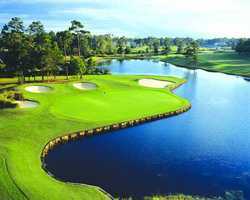 Discovered by Arnold Palmer along the Shallotte River, the Rivers Edge Golf Club is situated in the most breath-taking landscapes Myrtle Beach ever had. The moment that Palmer set eyes to the property he was convinced that the place has the potential to become something very special provided it is shaped by the most precious hands. This golf vacation destination indeed is transformed from primitive vistas to a more mature traditional golf course infused with the modern design. 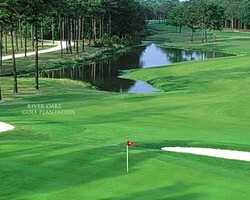 Six holes of this course provide an amazing view of marshlands bisected by the Shallotte River’s bend sand turns. The Rivers Edge Golf Club has various elevation changes, water hazards such as fresh water lakes, and sand bunkers to help players get the most out of the course. In 2000, Golf Magazine ranked this golf vacation resort as among the Top New Courses You Can Play. Offering amenities including large practice facilities, locker rooms, pro shop, as well as bar and grill, the Rivers Edge Clubhouse harbors breath-taking views of holes 9th and 18th perfect when eating breakfast, lunch, dinner, or snacks. With 7,000 yards off the championship tees, golfers of different skill levels can enjoy their rounds by choosing the right tees for them. Various golf vacation packages are also being offered by the Rivers Edge Golf Club for those golfers who wanted to pay less and play more. Since the resort has only limited memberships, every hobbyist golfer is encouraged to register earlier so as to guarantee their memberships. Members can enjoy full range of services from the clubhouse, practice facilities, driving range, pro shop discounts, and more. Secluded in the depths of 800-acre natural reserve along the Atlantic Intracoastal Waterway, the River Oaks resort secretly blossoms in the heart of the hardwood forest. As golfers come to visit this paradise, they can’t help but notice how accessible the downtown is from their location. The quite ambiance and traditional theme of this golf vacation destination makes golfers think that they got away from all the stress they encounter from their day to day lives at the moment. However, best attractions are just five minutes away from this so-called paradise including the Broadway, the downtown, and the Myrtle Beach Airport. The River Oaks resort harbors three courses namely the Bear, Otter, and Fox, which are based from native animals that can be found in the area. A clubhouse sits in the heart of the Otter course wherein hungry players get their fulfilling rounds of savory meals. This golf vacation resort offers elegant privileges for those visitors who availed on their memberships. Members enjoy 20% off discount in the pro shop as well as 20% discount in the snack bar. Members can also book tee times 7 days in advance and within 24 hours for other courses while League Tee Times are booked at least a year ahead. Lastly, a golf resort is not perfect without their competitive golf vacation packages offered to visitors. These packages greatly help guests in saving their money while still enjoying the round of their life. The River Oaks resort help every golfer fulfill their dreams by rendering high quality services at the most cost-effective prices. Infused with the modern golf course design and touch of natural landscape, the Ocean Ridge Golf – Panther’s Run course features wide landing areas and newly manicured greens. Architect Tim Cate once again exhibits his talent by blending the modern architecture to a breath-taking natural setting thus creating a new breed of golf vacation destination for players to unwind. 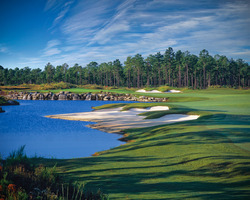 Included in Golf Digest’s Prestigious Places to Play, Panther’s Run is also included in the Top 50 of Myrtle Beach. The pro shop is ranked in the Top 100 Golf Shops in America four consecutive times. The Ocean Ridge Golf – Panther’s Run borders the edge of a natural reserve which test even the finest golfer’s ability to stay out of the Marshland. Generous fairways twist and turn with surprising undulations as well as picturesque water features blend together in order to form the perfect paradise for visitors, players, and guests. This golf vacation resort has 18 signature holes known for the challenge they bring to the players. Because of this, the Panther’s Run is included in Best New Golf Courses in America by Golf Digest. Golfers are taken into the peak of their dreams as far as 60-foot elevation changes make their experiences unforgettable. In addition, the Ocean Ridge Golf – Panther’s Run management decided to honor their valued guests by providing something they can look forward to. Different golf vacation package deals now await eager visitors on their website. Surely, this par 72, 7,086-yard layout is not just for show. It’s a place wherein players can really enjoy their vacations without having to spend a fortune.